A journalist is murdered while tracking an ex-Nazi who may be posing as an executive at a company called Space Associates Ltd. Perry comes to the aid of an American ex-GI who is charged with the killing and is still suffering from his own �cowardly� past. Location: Serra Retreat. One of the amazing things about Perry Mason is they don�t disguise location. This episode set at a retreat in a Francisan Order is in fact an actual Francisan Order in Malibu that does offer retreats. The 50-room mansion was first built by the Rindge Family in the 1920s. The Rindges owned all of Malibu at one time but got in costly lawsuits with the government and railroads over access through their property. Consequently they ran out of money and were never able to complete the structure, selling it to the Francisan Order in 1942. Serra Retreat as it is now known is closed on weekends but you can visit it for free during the week. Access is off of Pacific Coast Highway. There is a guard gate but if you tell them you are going to Serra Retreat they will let you through. Submitted by Eric Cooper, 8/13/2009. Edited by gracep, 12/1/2010. + The Rindges were also known for their Adohr Farms Dairy in Encino (Adohr is Rhoda Rindge�s first name backwards) and their world famous Malibu tiles. Rhoda Rindges� home called the Adamson House is on the beach directly across from the entrance to Serra Retreat. It is now a historical landmark and well worth the $5 docent tour. Posted by Eric Cooper, August 13, 2009. For the seventh time, Karl Held appears as dapper young David Gideon, law student and sometime assistant to Perry Mason and Paul Drake (and Della Street, come to that). He has two more appearances left. Submitted by gracep, 12/1/2010. + Seven appearances and he still calls Perry "Mr. Mason"; even allowing for the greater emphasis given to "respecting your elders - as well as your boss !! - at the time, this episode has element of formality that makes it seem stiff. Notcom, 011417. Here we have yet another episode in which Lt. Tragg (Ray Collins) is credited but does not appear. Good thing Lt. Anderson is around. Submitted by gracep, 12/1/2010. Sightings: In the courtroom gallery, behind Osborn and Winifred Dunbrack on the prosecutor�s side, �Miss Carmody� and Quiet Old Man #1 sit together. On the second day of the hearing, the priest comes in and sits next to our taciturn friend. �Sasha Magaloff� is on the front row on Perry�s side. Little Old Lady #1 also shows her demure face in the gallery. Submitted by gracep, 12/9/2010. + The Pencil Mustache Man sits in the gallery, too, and visibly reacts to the testimony. Submitted by gracenote, 7/13/2011. CARS. (1) Harlan Merrill's 1961 Buick Electra 225 Convertible, medium-color body, white top up. In the interior shots you can read "ELECTRA 225" on the dash above the glove box. (2) Perry's white 1961 Lincoln Continental Convertible, top up, Licence No VUD 434. (3) 1962 Plymouth Savoy 4-Door Sedan Police B&W, parked beside the chalked outline of the murdered body (17:17). Sgt Brice gets out of the driver's seat and waves up to Drake, Gideon & Lt Anderson (wearing hat) looking down from Serra Retreat. More photos here. This is the First 1962 Model-Year Car to appear in the series. See Comments section for ID features. (4) 1961 Ford Fairlane 4-Door Sedan Police B&W, parked beside Car (3). Background Cars (a, b, c): three 1956 Plymouth Plaza 4-Door Sedans, Yellow Cab Co on rear doors, waiting in taxi line outside "LOS ANGELES COUNTY COURTHOUSE". These fleet taxis are a bit more austere (eg, missing some trim) than the general sales version. It's no accident that Car(3) 1962 Plymouth Savoy Police Special is the first 1962 model-year car in the series. One year earlier, the first 1961 model-year car to appear was a police 1961 Plymouth Savoy 4-Door Sedan in Ep#106. Police departments and taxi companies were prime prospects for the automakers' Fleet Sales arms. I suggest that the '56 Plymouth taxis (suggesting high-use durability) could have been connected to the Product Placement of the Plymouth police car. I bet a lot of Police Chiefs watched Perry Mason! Added by Gary Woloski, 2/13/13. Half Over (or is it half to come??) as determined by the Episodes listing on this site, this show represent the exact mid-point of the series. Submitted by Notcom, 122115. TCOT Curious Coffee Set: At 31:53 Perry has a Curious Coffee cup on his desk and David uses the Space Age Metallic Carafe to pour himself a cup as well. A third cup sits empty on the round table. Submitted by catyron 02/17/2018. Note the chalk outline on the dirt road where the body was found when the police investigate. jfh 25Oct2018. Is it just me, or is Burr (Mason) reading his lines from the paper in his hand while he questions Emery Fillmore (Denver Pyle)? Submitted by gracep, 12/9/2010. + No, I don�t think it's just you, gracep! The impression I got, however, was that just before shooting, Denver pulled a prank or told Raymond an off-color joke and Burr couldn't look him in the eye for fear of breaking out in guffaws. Maybe not, but the idea makes watching the show more fun! Submitted by GaryW, 9/27/11. Identifying Car (3), 1962 Plymouth Savoy. Car (3) is seen from a distance and from above but the quirky styling of that era's Chrysler Corp cars still gives several visible clues to its identity. First is the rear deck/trunk styling inherited from '61 Plymouths. Other visible features which exactly match the 1962 Plymouth Savoy 4-Door Sedan are the shapes of the C-pillar and rear window, two small taillights and the rear door shape including the flange-like ridge along the lower edge of the rear side window. 1962 Plymouths were present in California by 28 Sep 61 according to the LODI (Calif.) NEWS-SENTINEL article Plymouth For 1962 Makes Debut Today In Lodi of Sep 28, 1961 (72 days prior to airing of this episode). Added by Gary Woloski, 2/13/13. The Battle of the Bulge (Dec. 16, 1944 -January 28, 1945) involved nearly 1 Million soldiers & resulted in 67,000 US & 100,000 German casualties [National WWII Museum website]. Ironically, the crucial battle began the Same Day Ike got his 5th Star. Mike Bedard 7.8.16. Scientists like Werner von Braun worked on Germany's V[engeance]1 & V2 Rocket programs before working for the US Space Program. Several were suspected of being dedicated NAZIs & at least 1 was later deported. Mike Bedard 7.8.16. This episode sure packs a lot - two secret identities, extortion and embezzlement, a Nazi and a secret marriage. The string music during the fight sequence is very unusual - perhaps the influence of 'Psycho' which came out the year before? When Lt Anderson addresses the group outside the retreat, it looks like he and Perry are standing in front of a painted backdrop while the group of men are definitely on location. 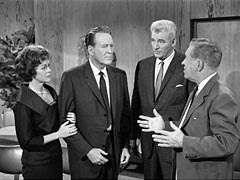 Sorry, but if this had been the first Perry Mason i watched, i never would have tuned in again. Father Paul's smugly religious pop-psychology gave me the creeps. Raymond Burr cold-reading his script was bizarre. On the good side, though, both my husband and i were fascinated by how closely Donna Atwood the ice-skater resembled Barbara Hale. Submitted by catyron 02/17/2018. TCOT Absent Accent I love this episode for its complexity, and for its giving Della more screen time and lines again, but it takes a huge suspension of disbelief! 15 years ago, Hennings (sorry, can't recall his German name), apparently anticipating Hitler's defeat and his own opportunity to flee to an Allied country, learned fluent English, erased his German accent, and worked up a British accent so that when he came upon a dead Allied soldier he could assume his identity and mix in with the other Allied soldiers, no questions asked. Hard to swallow! This would hold true no matter who the Nazi turned out to be. The minute Vander told Barlow he was looking for a Nazi on his staff, I knew we were in preposterous territory, as Barlow did not say, "Huh, could be X, he has a trace of a German accent...." LOL. Submitted by JazzBaby, 3/5/2019. + Per Perry during the last scene, Hennings/Kleinerman had previously been in England where he had spent years going to school. Someone young enough can learn to speak two or more languages like a native speaker in each language. Submitted by (lowercase, with a comma and period) masonite, 03/15/19.